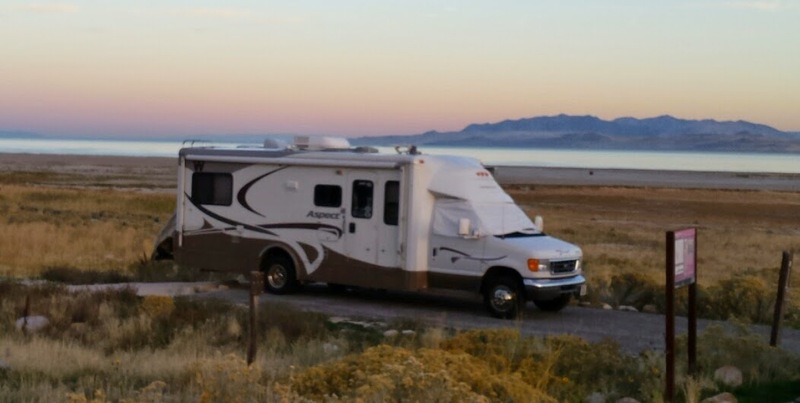 We’re ten days into Part Two of Lilypad’s great adventure and find ourselves at Antelope Island State Park in the middle of the Great Salt Lake. Meadow larks greeted us this morning as we walked around the campground, marveling at the huge harvest moon setting into the lake to the southwest while at the same time, the sun came up over the mountains in the east. This island is a refuge for birds, bison, prong horn antelope, big horn sheep and people. Yesterday we toured the historic Fielding Garr Ranch, the first permanent residence on the island. We looked across at Salt Lake City, dwarfed by the vastness of the lake and mountains surrounding it. The buffalo were all over the road, but the long-eared jackrabbits out in the prairie refused to hold still for pictures. A week ago we briefly toured Joseph, Oregon, identified by National Geographic as one of America’s Small Town Great Escapes, and a site along the Hell's Canyon National Scenic Byway. Blessed with three bronze foundries, the town has public statues on every corner and the ornamental maples along the historic downtown main street delighted us with our first blaze of fall color. The flourishing little shops spoke to the power of art to support a small town economy, although no doubt the beautiful surrounding ranches and remote recreation areas don’t hurt either. Then we enjoyed the paved Forest Service road through the Wallowa Mountains, stayed in a $3 campground, and stopped at the spectacular lookout over the Snake River at Hell's Canyon. In Idaho we stopped to visit dear friends Connie and Craig who recently moved from Alaska to an airpark near Nampa. While we were there, we managed to visit briefly with Janna’s sister and brother-in-law, and another old Alaskan friend, Carol and her partner Judith. Connie and Craig took us on excursions to Boise and Nampa where we were impressed with the friendliness of the people and the prevalence of paved bike trails. We also stopped at the World Center for Birds of Prey. Perched high on a ridge above the prairie we watched half a dozen different kinds of raptors soar and interact with human handlers. The facility is famous for breeding California Condors and we met the grandparents of some of the birds that now fly free in California and Nevada. We are surrounded by desert, and surprised to find hot springs everywhere. Next door to Connie and Craig’s house, we took a swim at Givens Hot Springs, a funky old pool that was established in 1881. Then we followed the Snake River and the 1000 Springs Scenic Byway, landing at Banbury Hot Springs where we enjoyed a virtually empty campground and solo swims in a large pool constructed in 1920. This area is also famous for the discoveries of ancient equines and other fossils in the million year old fossil beds and hosts the Hagerman Fossil Beds National Monument. So now we are on the Great Salt Lake, another oasis in the desert. It's too salty for fish, but it's perfect for brine shrimp and algae making it a paradise for birds and people who love birds and beautiful views. Last night we paired up with neighbors in the campground to play some not great, but enjoyable music with Liz on the fiddle and the neighbor on the guitar. Water in the desert; music in the desert. What could be better that this? Tomorrow we will explore the history and modern reality of Salt Lake City. Then it's back to nature as we head for the great national parks of southern Utah.